Via the text icon You can reach a guide to a walk in Elsinore. In the left meny You can get more information from the historical part of Öresundstid. You return to the guide when You click on the title "Town Walk in Elsinore" in the left meny. Elsinore is, historically speaking, an international town with a dramatic history. With only approximately four kilometres to Sweden across the Sound, the town has been a ferry town since the Middle Ages, but also a castle town and from 1658 a border town too. For several centuries Elsinore and Malmo competed for the title of second largest city in Denmark and left is, largely due to far-sighted politicians and a very active population in the 1960´s and 70´s, one of Europe’s best preserved town centres. Well-preserved and gently restored buildings lie like a string of pearls in a rectangular, chessboard-like street network from the 15th century. The architectural appearance of individual houses shows styles from the 16th century to the present time. 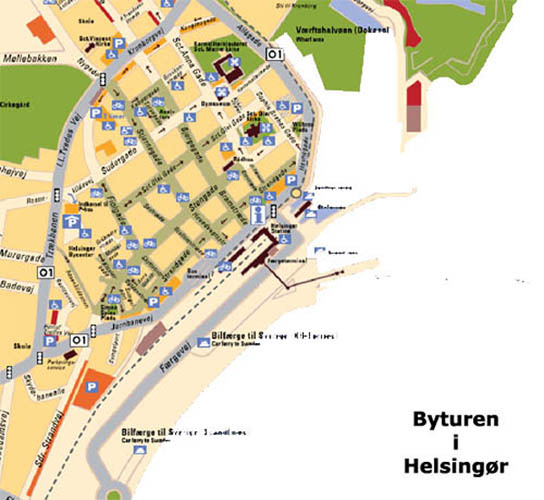 A stroll through the town can be done in an hour and we start this town walk at the Svea Column on the harbour square. The Svea Column was erected in 1947. Its inscriptions express the gratitude of the Danes for the hospitality shown the refugees from Denmark by the Swedish state during the Second World War. Among them were many Danish Jews. Today a number of preserved buildings on the east side of the square are missing. After a tragic hotel fire in 1938 the buildings were demolished and the place was converted into a parking lot. The solid red building on the harbour square is the Custom House, built in 1891. Formerly here was a warehouse from 1781. The relief of Chr. 7., which is seen over the entrance gate originates from that warehouse. Since the 1970´s the building has functioned as a very active culture centre. The Elsinore station building is from 1891. It is built in a style known as neo-renaissance. Many foreigners believe that this is Kronborg Castle! Ferry traffic and train traffic is effectively linked here. In an hour and a half a Scanian amuse himself in the entertainment places Bakken and Tivoli or find work opportunities in large parts of the Sound Region. The inhabitants of Elsinore can find low-priced housing in Helsingborg. Stephen Hansen´s Mansion. Built in 1760 in rococo style for war commisioner Stephen Hansen, an important man at The Sound´s Custom House. The mansion is designed by the well-known architect Philip de Lange. The Claessenske Mansion. Built in 1793 by ship owner and merchant J.J.Claessen. The building style is a peculiar form of neo-classicism. Rasmussen`s Yard is built in 1637 by customs examiner Christen Rasmussen. The anchors in the façade form the initials of the builder and his wife, Kirstine Olufsdatters. The building is known today as the Shipbroker Yard, and is a museum for the time of the Sound Dues. Here is a shop, which sells ”original” goods. In the yard there is, as in the 18th century, a small brewery, which produces the house’s own beer. Via the narrow, almost claustrophobic, medieval Gl. Færgestræde, we are now going to the town´s main street. In the lane chickens and pigs went around rummaging in the garbage the residents had thrown out. You can imagine the stench and Elsinore´s many plagues along with the presence of countless foreign sailors probably be attributed to the eldorado, which was created here for rats and other disease carriers. At the mouth of Gl. Færgestrædes in Stengade we are now on the main street. As implied by the name (Sten = stone), it was here that the well-to-do citizens in medieval Elsinore built the first stone houses in the town. Oxernes´ Yard, built in 1460 by the vassal on the fortress Krogen, Johan Oxe. Later the house was inhabited by “the father of the Danish written language”, Chr. Pedersen, who in the first half of the 16th century, was the first to translate the bible into Danish. Note the comb jagged gable from the original building. Dahl`s Yard. This is an exquisite example of the baroque. The yard was constructed by the merchant Nicolai Dahl in 1739 and appears on the whole as when it was constructed. Diagonally opposite Dahl´s Yard is the Elsinore Town Hall. It was built in 1855 and monastic bricks form the old town hall, have been used. It was situated in the same place and was built in the 1560`s. Above the entrance you notice two sandstone rosettes from the old town hall featuring the coat of arms of Frederik II and Queen Sofie. The grandiose building is in neo-gothic style. It was built a few years before the abolition of the Sound Dues, at a time, when the town could not foresee the financial torpid state it would sink into. Via another small lane, Brostræde, we now move down to Strandgade. The name of this lane (bro= bridge or landing stage) has the same maritime origin as Færgestræde. It led down to the landing stages, which made up the original harbour of the town. Today the small lane is internationally known, especially among children, for here we find the ice cream shop, where you can buy Elsinore’s famous Brostræde ice cream. Strandgade is several centuries younger than Stengade (Strand = beach or seashore). The seashore line was earlier much closer to Stengade and it was not until the town wall was built in 1620 that the area began to look like a street. The old Swan Pharmacy. The original house is from around 1500 and built in late-gothic style. From 1578 it was the town´s pharmacy. On the facade you see swans and a sundial. The anchors form the year 1634 and the builder´s initials, alderman, Johan Kruse and his wife. The house stopped functioning as a pharmacy around 1970. We continue right by Strandgade with the harbour to our left. Marstrand´s Marine Stores from 1847 is a fine example of a shop dating back to the Sound Dues. The house is probably one of Elsinore’s most beautiful renaissance houses and has been listed. Over the neighbour house, Strandgade 53, you can see a wing pole with three crowns on top of each other. They testify to the 100 years after 1750, when the building housed the Swedish consul general. Nowadays a modern house. An earlier house on this lot was from the 18th century and was owned for long periods of time by Elsinore’s Jews. Around 1800 it was the Jewish school and synagogue. The oldest dated half timbering building in Elsinore and one of the most interesting houses in town. As the year on the entrance says, the house is from 1577 and housed for many years the public house, ”Ankeret.” (The Anchor). Notice the leaves and the keel arches, which have been carved in the woodwork. Notice the sharp bend, which breaks off Strandgade here. The house was built in the 1760´s and has, until the abolition of the Sound Dues in 1857, always been inhabited by ferrymen. From 1801-1807, for instance, by the bold and infamous pirate, privateer and adventurer Jens Lind, who was particularly known for his fearless effort during the war against England 1807-14 and for a voyage to Russia in a snowstorm in a small open dinghy. We leave the house of ”the bold ferryman” and takes a few steps back. Here we find Gyldentræde, which is the last of the transverse lanes, which lead from Strandgade to Stengade. We walk up Gyldenstræde and left by Anna Queenstraæde. Gyldenstræde has been named after the merchant Knud Gylden, who owned the house Gyldenstræde 2 in the period 1736 - 1771. Between Gyldenstræde and Skyttenstræde we have the small picturesque lane, Anna Queenstræde, which has been named after the merchant Hans Quies widow. The merchant owned most of the houses in the lane. Anna Queenstræde 2 is most likely built in the 17th century and in the 18th century it housed a brewery and a distillery. At the end of Anna Queenstræde we turn left by Skyttenstræde. 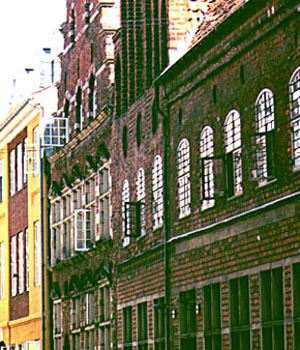 The lane is named after the generation Skyts, who inhabited the corner house facing Stengade in the beginning of the 18th century. The small houses in the lane was rented flats in the 17th century, but was later bought by ferrymen and fishermen. We walk through this snug lane and turn right by Stengade. Mayor Iver Pedersen´s yard on the corner of Skyttenstræde is from the 17th century. The building is one of the few of the many half timbered houses, which are left from the Renaissance in Elsinore. Notice the carved keel arches, flowers and acanthus leaves in the woodwork. ”Jochm Langens House” The inscription in Low German over the door reads translated: ”The honest man Jochm Langen let this house build in the year 1604, February 3. Where God does not give his blessing on the house, everybody works in vain” Notice here also the carvings in the woodwork. "The Swedish Consulate”. Built in classicistic style approx. 1784 for the the Swedish general consul. The building is crowned at the top with a shield carrying the Swedish King Gustaf´s initials. In a room on the first floor the French army commander Bernadotte abjured his Catholic faith in 1810 and converted to Protestantism in order to become king of Sweden. The building was taken over by the Royally Privileged Shooting Society in Elsinore, hence the initials over the gateway. "Hotel Øresund". Originally this house was medieval, but it has been rebuilt several times, latest in 1904. Above the corner window is a text tablet with a Low German inscription in memory of the plague in 1654. Translated into English it says: "Many are annoyed by what he sees, but must nevertheless tolerate that it happens in 1654". In 1771 the building was converted into a hostelry, the finest in town. The hotel enterprise continued all the way to the 1960´s. Now we turn left by Bjergegade. The name stems from a rise in the street. The Square was established after a fire in 1864. Formerly vegetables, meat and fish were bought other places in town. Now market days are Wednesdays, Fridays and Saturdays. And so we turn left by Sudergade. Suder is from Low German and means ”cobbler.” The cobblers stayed here, which formerly was the outskirts of town, because of the stench from the tanning of the leather. The Karmeliter Monastery is from the latter half of the 15th century and the best preserved medieval monastery in Northern Europe. After the Reformation in 1536 it has, among other things, served as a hospital and grammar school. Now it houses the administration for the diocese authorities in Elsinore. The Church of Saint Mary, which is part of the monastery complex, was administratively separated from this and converted into Elsinore´s “German church” for the many Germans and Dutchmen, who lived and worked in town. The church organ is a big attraction. It is from 1663, where the organist was the famous composer Diederich Buxtehude. The church gives many organ concerts for a large audience. The Karmeliter House was converted into a hospital by the Karmeliter monks in 1516 an had room for 8-10 beds intended for foreign seamen. In 1630 Elsinore town bought the building and converted it into a workhouse for up to a hundred poor wretches, who were occupied with spinning, repairing ropes and the like in wretched conditions. The house had this function until 1902. Today the building houses the Elsinore Town Museum. Now we walk down Hestemøllestræde with the monastery on our left. In Elsinore, like in most Danish towns the distance from the church to the public houses, has never been far. On the corner of Hestemøllestræde and Sophie Brahesgade there is a building, which is the last remnant of Wiibroe´s Brewery´s plant here. The building is from 1862 and built by the founder of the brewery, Carl Wiibroe. In the 19th century the beer production went from home brew to large scale industrial production. In Elsinore this development led to the making of one of the largest workplaces in the town: Wiibroe Brewery. It became a part of the industry, which became the lifeline in Elsinore after the abolition of the Sound Dues. The corner of Hestemøllestræde and Sophie Brahes Gade earlier housed an estate inhabited by Tycho Brahe´s sister and research assistant, Sophie, who the street has been named after. We take this street and turn left in to the church square. St. Olai Church, Elsinore´s Cathedral, is originally a one-nave, Roman brick church built in the period 1200-1250. In the North wing you can see 20 meters of wall from the original building. Around 1560 the church had the appearance it has today, but for a period from 1615 the church had an impressive 50 meters tall spire, called “Elsinore´s Virgin”. Unfortunately the wind blew it down in 1737. The front building is from 1682; but parts of it are from the Middle Ages. The house functioned as an organist home for St. Olai Church, where Buxtehude´s father was the organist. Buxtehude himself lived in the original house, while he was the organist at the Church of St. Mary from 1660-1668. Later the house became a public house and a butcher´s shop, and today it is living quarters. From the church square a small passage leads back to Stengade, where we shall see a couple of noteworthy houses from the Renaissance. In everyday language: The Judge´s Estate, is built in late Gothic style and is also called The Lejele+s Estate. It is built in the 16th century by the Scottish family The Lejele. Two members of this family, father and son, both became mayors in Elsinore. Customs officer David Hansen’s estate, built in 1579 is a well-preserved, commoner’s Renaissance house. The customs officer never lived here himself, but rented it to Chr.IV’s financial advisor, Jonas Charisius. We continue to the end of Stengade, which ends in Wiibroe´s Square. Here was The Sound´s Custom House, designed by N. Basse in 1740. It was demolished in 1860, after the abolition of the Sound Dues. The lion in the middle of the square was part of a fountain, which was placed in front of the customs house. This square is dominated by two mansion-like buildings, which both were built by officials at the customs house. Trentwedel´s Estate, also built in 1770 in rococo style for passport scribe J.F. Trentwedel, who was mostly known for his poor discharge of his office. Today the building is called: ”Færgegården” and houses several restaurants. Customs Commissioner Frantz von der Osten´s mansion, built 1770 in rococo style. We will now proceed to the harbour, to the right and are back at the harbour square. Here we end the town walk. Via the linkicon you can reach homepages, where you can get informations about prizes, booking etc. If You click on "Townwalk in Elsinore" in the left meny, You will return to the guide. In the end of the 18th century it was the eagerness to build, which came from the top civil servants and the merchants. Our Lady Monastery in Elsinore was built during the second half of the 15th century. It is very well preserved and is thus unique in Europe. It is a fine example of the Baltic Gothic. The first monasteries were placed in the country and it was not until the emergence of the mendicant orders that monasteries were placed in towns. This development continued in the 15th century, when Karmelite monasteries were founded in the Sound region. The Karmelites had their origin among hermits in the mountain Karmel in the holy land and in 1226 the pope approved the Karmelite order. The Karmelite order was one of the strictest in the Catholic Church and they started early with monastery schools. Gradually the severe monastery rules were lessened, but in the 16th century they were tightened again. The Karmelite monks were well educated and their monasteries were to contribute to increased knowledge and education in the town. Karmelite monasteries were founded in Landskrona in 1410 and in Elsinore in 1430. The late medieval monastery building in Elsinore is the best preserved and worth a closer study. It was Erik of Pommern, who donated the land to the monastery and the pole approved of the plans in 1431. After a fire in 1450 they had to rebuild the monastery, which was a time-consuming and expensive undertaking. A large monastery building like that was expensive to run, but the royal power supported the activities and it was also a common with soul gifts. The vassal in Krogen in Elsinore, Poul Laxmand, donated 100 Lübeck mark to the monastery. Poul Laxmand was at the time the richest landowner in the country and he made several donations. 10 year after the first donation you could read in a letter that Lawmand had donated nine hundred Lubeck mark Danish money, ”for which a monastery’s church and cloister was built with the help of many good people”. He also possessed the most prominent position in the kingdom. He was chancellor, which meant that he functioned as liaison between the king and the parliament. He was murdered in the street in Copenhagen in 1497. The king, Hans, felt that Laxmand in fact had been a traitor and confiscated all his property. Poul Laxmand was buried in the Our Lady Church in Elsinore and you can see his family’s coat of arms in the monastery. The chapter hall has been named after him; it is simply called ”The Laxmand Hall”. Poul Helgesen was born in Varberg in Halland and in time became one of the most important persons in the Karmelite monastery. He was attached to the monastery in 1517 and in 1519 became the principal of the college in Copenhagen. He taught at the university and form 1522-44 he was the leader of the Karmelites in the North. Poul Helgesen was a defender of the Catholic Church until the Reformation in 1536. But he also fought for the internal reformation and development. After the Reformation in 1536 the Karmelite monastery stopped functioning as a monastery and became a hospital for the old and sick. It is said that the monks had to get tithe and handouts to run the hospital. The old monks were allowed to stay on and adapt to the new situation. The Our Lady Monastery in Elsinore is unusually well preserved. It was built and rebuilt in the latter half of the 15th century. The ground plan was typical for the monastery buildings of southern Europe. The different wings in the almost square building had different functions. The economy department with cooking facilities was in the north wing and the monastery church (The Mary Church) in the south. Inside is a roofed cloister, which goes all the way round the square inner yard. The building material is brick, which is typical of the north European or Baltic Gothic. The three naves in the church are also typical of the north European style, where the middle nave does not let in the light. This half basilica style testifies to the influence of the Wend Hanseatic towns and is also present in the Mary Church in Helsingborg, which was built at the same time as the Our Lady Monastery. Gothic pointed arches can be seen everywhere in doors, windows, house ends and in the cloister. The ends of the church are a display of brick Gothic’s architecture. The east and west end have stair formed edges with four vertical dims on each side of the 11 metres tall middle window. Above this window and above the side windows there are broader dimmers with varying patterns (circular, pear shaped and pointed arches). Inside the monastery the gothic vaults and columns are richly varied. Most common are the simple cross vaults, which are in the church and in the cloister, but in the chapter hall (Laxmand hall) there are sophisticated net vaults with inlaid symbols and coat of arms. Some ornaments, done by the sculptor Adam van Düren, are in the chapter hall. He built Glimmingehus and he also restored Lund´s Cathedral. With this artist we are brought nearer a new age and in the monastery there are many things, which testifies to the dawning age of the Renaissance. One example is the stone building opposite the entrance of the monastery church, and which was attached to the monastery from the start. The building is interesteing as it contains elements from the Gothic as well as the Renaissance. On the house end there are horizontal profile bands and vaulted sides, which are typical of the renaissance style. In the inner rooms of the monastery there is an abundant variation in Gothic vaults and pillars. The simple cross vault is predominant in the church and corridors, while the chapter hall or the Laxmand hall has sophisticated net vaults with engraved symbols and coats of arms. Ornamental figures in the corners remind the noble karmelite monks of the temptations of earthly life. The originator of these figures and the other sandstone work is probably the sculptor and architect Adam van Düren, who also is in charge of the building of the late medieval castle Glimmingehus in Østerlen in Scania and later the restoration of Lund Cathedral. Adam van Düren portends another age. The Karmelite monastery is a traditional medieval building, but many traits in the ornamentation point towards the dawning Renaissance. Not only the monastery points toward a new age. Diagonally opposite the monastery church there is a stone building, which originally is associated with the activities of the monastery. When you walk around in the building you enter the Renaissance from the Middle Ages. On the western gable end, which faces St. Annægade, and represents a later addition you will see the horizontal profile bands, which is typical of the Renaissance. The northern gable facing the monastery complex is ornamented with the fluctuating gable ends typical of the Renaissance. These can also be found in mansions and royal castles later in time. 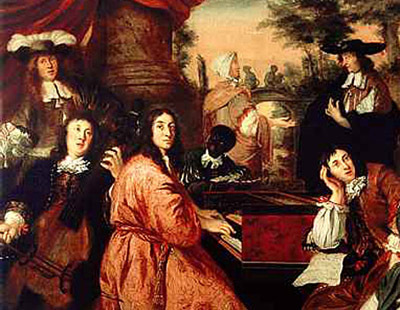 Buxtehude ended his career as an organist in Lübeck in northern Germany. This picture is from there. Before Buxtehude was a good example of a Sound citizen, who worked on both sides of the Sound, in spite of war and trouble in the area. It is difficult to say how the man in the street experienced Scania´s abrupt transition to Sweden at the peace treaties in 1658 and 1660. In paragraph 9 in the Roskilde peace treaty it was stated that all estates in Scania had the right to maintain their distinctive cultural characteristics and inherited rights, so nothing prevented them from living as they had done before. Furthermore it was difficult to say how much nationality meant for the individual. Sweden as well as Denmark was at this time complex – in reality multinational states, which to some extent demanded some loyalty from their citizens, but hardly a national disposition in the modern sense. That came with Romanticism’s worship of the nation and the people at the end of the 18th century. The example of the composer Diderich Buxtehude may illuminate this connection. Posterity has not succeeded in establishing where he was born – in Holstein, Elsinore or Helsingborg – in any case he was born in an area, which belonged to the Danish state around 1637. His father, Johannes Buxtehude came from Oldesloe in Holstein – to where he probably had emigrated originally. In 1638 he became an organist at the Maria Church in Helsingborg. In the years 1638-41 the father worked in Helsingborg and here Diderich had some childhood years. In 1642 the father was the organist at the St. Olai Church in Elsinore, where he was active until around 1670. Diderich Buxtehude thus spent his childhood and youth in Helsingborg and Elsinore. During the first half of the 17th century the musical scene at the Danish court and in the major churches was of a very high standard. (It is to be remembered that the court and the churches at that time were the most important customers, when it came to music and thus the music scene evolved around these institutions). Names like Heinrich Schütz and John Dowland are still remembered. Schütz was a church musician in Copenhagen and there he established the court orchestra. Dowland, a famous lutanist and composer, was a court musician. He lived in Elsinore. Johann Lorentz worked during the first half of the 17th century as a royal organ builder and he built or rebuilt all the important organs in the Sound region in a quite conservative renaissance style, a style, which then were represented by Schütz and Dowland. 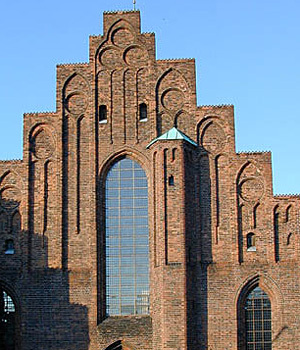 One of the most important remnants of Lorentz´s activity is in the organ facade in the Holy Trinity Church in Kristianstad. Diderich Buxtehude followed his father’s footsteps and became the organist in the Maria Church in Helsingborg. In 1660 he applied for and got the organist post in Elsinore´s Maria Church. Probably because this post was better paid and by taking it he came closer to the rest of his family. In the time up to 1668, where he went to Lübeck to apply for a post there, he lived in the same house as his mother and father. The house still stands. Simultaneously the old Lorenz organs were modernized in a modern Baroque style, a style, which was represented musically by Diderich Buxtehude. The German organ builder did the modernization and he was the man behind the building and rebuilding of organs in Copenhagen, Elsinore, Halmstad, Helsingborg, Landskrona and Malmo. Diderich Buxtehude experienced and participated in a very active renewal of the music scene through the new building, which was made. Two years after he had moved to Elsinore he came back to Helsingborg to supervise the rebuilding of the organ in the Maria Church. This indicates that the Swedish takeover in Scania in 1658 did not affect the music scene right away. In his time in Elsinore Buxtehude kept in close touch with Swedish as well as Danish officials. The only piece of music we know of that Buxtehude wrote in his time in Elsinore, is from 1665 and dedicated to Christoffer Schneider, a Swedish postmaster and later consul resident in Elsinore. From his time in Elsinore Buxtehude also was friendly with the Swedish court conductor and organist Gustav Büben. Perhaps it was on his request that Buxtehude composed the wedding cantata to the wedding between Carl XI Gustav and his Danish queen Hedvig Eleonora in 1680. In 1668 Buxtehude moved to Lübeck, probably for career reasons, but also to get away from the meagre financial circumstances in the devastated Sound region. The three Maria Churches in Helsingborg, Elsinore and Lübeck are the main threads in his life. Even though he spent most of his active life in Lübeck and even though he achieved fame and honour there, he never forgot his roots by the Sound. That was why the periodical “Nova litteraria Maris Balthici” could claim in 1707: “He considered Denmark his native country” (Patriam agnoscit Daniam). Diderich Buxtehude´s career as a composer and an organist culminated in Lübeck and great composers like Händel and Bach came and listened to his music. He was especially renowned for his “Lübecker Abendmusiken”, which were concerts in connection with the evensong before Christmas. He wrote new organ works for this every year. Elsinore can show examples of distinguished commoner´s houses from the end of the 16th century and the beginning of the 17th century, where the town flourishes and is considerably enlarged. 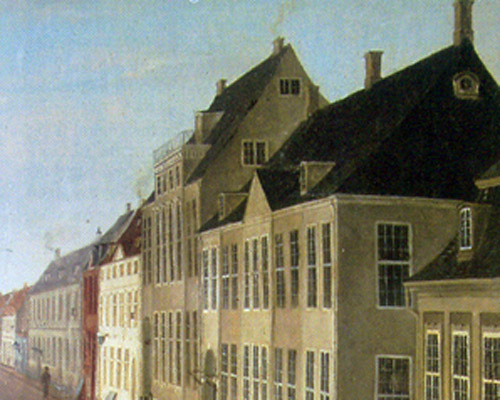 Here is the row of houses in Stengade 70-76, where a late Gothic stone house, the present magistrate´s office, is succeeded by af gable house with typical style traits from the Renaissance. The building of Kronborg was founded on a practical cooperation between the royal power, the town and many hired craftsmen, who lived in Elsinore. The activities surrounding the building, but even the increasing trade and the business brought in by the Sound duty, led to the increase of the population. This also led to a clear element of foreign inhabitants, for instance Germans, Dutchmen and Englishmen. This meant that new houses had to be built. Some of the houses had a direct connection to the work in Kronborg. This was the case with for instance the customs officer David Hansen’s house in Stengade 76, built in 1579. Jörgen Kock built a stone house in Malmo around 1525 – an early example of the affluent resources of the upper classes. The house still has the staircase house ends of the Gothic, but the horizontal bands of sand stone and the decorations of the house end front anticipates the entry of the renaissance style. It wasn´t until 1882, when Elsinore Iron Shipyard was opened that development picked up speed and from here on you could really talk of an industrial breakthrough. The shipyard with Mads Holm leading it involved extensive investments, an increased mechanization and a great need for labour. Around 700 workers were employed in the beginning and of them 300 from abroad. “Take a town like Hillerød... No, leave it; but take Elsinore! A small, strange nest, isn’t it? Pressed together under tall hills along the sea, which lifts Kronborg imposingly on a shield, Kronborg, which seems to crush both church and town hall and the new railway station. Und muss doch leiden, das geschieht. With this description Holger Drachmann characterizes the development, which took place in Elsinore in the course of the 19th century, the transformation from Sound Duty town to modern industrial town. Elsinore new Town Hall was finished in 1855. Previously it had been the object of a heated debate, which wasn´t or isn´t unusual, when major changes were on the agenda. The reason for the new building was that the old town hall from the 16th century was in need of a renovation of the jail. On the way they realized that a rebuildig like that required that the old town hall had to be demolished. The debate was whether the new Town Hall should be built in Axeltorv. Finally the new Town Hall was built where the old one had been, but they didn´t avoid the budget excesses, known from the the present time. Had they known in 1854/55 that the Sound Duty would disappear just two years later, the town probably wouldn´t have had such an impressive building. For more than 400 years the town’s life and development had been closely linked to the trade and the administration, which was brought on by the Sound Duty. With the abolition of the Sound Duty in 1857 a new epoch in the history of the town was ushered in. In spite of the sudden transition, which was marked by the banishment of the Sound Duty, it was a change, which had been underway for a long time. As early as the end of the 18th century people tried to start larger enterprises on private initiative, often in conflict with the influential interests of the guilds. Individuals like the Englishman J.D. Balfour and J.J. Claessen were pioneers, who also invented new production methods, but the big plans of starting the shipyard did not come off, and an enlargement of the harbour paid by the state did not start before the 1820´s and was mostly to the benefit of the activities, which was attached to the custom-house. The first real industrial enterprise with a high degree of mechanisation and division of labour was a gasworks, built in 1853 by the Danish Gas Company, backed by English capital and technology. Second to Odense it was the first gas works in the country, originally intended to renew the street lighting, but in the course of time it also supplied the private and business sector. The gas works was placed in the Grønnehave neighbourhood, which together with the town centre developed into an industrial centre. Here the town’s new waterworks was built and it replaced a plant, which dated all the way back to Frederik 2. In the present Højstrup Godthåb glassworks was situated from 1848 to 1895. Godthåb glassworks and other industries later came to the area. In general this was the first phase of the industrial process, from the end of the 1840´s to the middle of the 1850´s. The development is characterized by some new plants (glassworks, gasworks, tileworks and breweries, and an industry count from the year 1855 showed businesses with 354 employees, of these 20 businesses with more than 6 employees. In the town middle a number of new industrial plants were started. Among other things Carl Wiibroe started as early as 1851 to brew Bavarian beer, which he stored in the casemates in Kronborg castle. In 1862 he bought the site by the harbour, where the remains of the brewery now lay opposite Hestemøllestræde, and where he in 1878 built storerooms and installed engine power. Carl Wiibroe was also very active in the public life, as early as 1842 he was elected to the municipal council, where he became chairman several times around. Another entrepreneur in the town centre was Jens Levin Tvede, who transformed a small distillery in Sudergade to a manufacturing business in Stjernegade, where he made spirits, snaps, yeast and household beer. He was also contributory to the fact that the telephone came into use in Elsinore around 1880. J.L. Tvede was elected town council man in 1857. In order to lighten the transition from the banishment of the Sound Duty Elsinore got a special appropriation, all in all a sum of 60.000 rix-dollars, which was partly used to the support of the laying out of Marienlyst Seaside Hotel. More important was the enlargement of the harbour in 1862, at which the custom house almost symbolically disappears. With the freedom of trade law the guilds disappeared and gradually also the market town zone, which contributed to the protection of production and trade in a circumference of approximately 15 kilometres. In 1864 the north railway opened with 60.000 passengers a year and a direct link to Copenhagen via Hillerød. In spite of these enterprises there was a decline in industry and the increase in the industry census until 1975 was very modest. At this time there were 37 businesses with a total of 478 employees, corresponding to approximately 5% of the labour force. The increase happened in the provision business (spirits, beer, margarine). In the town centre the predominant business were smaller trade businesses. Even though Elsinore, apart from Copenhagen was the most important industrial town in Zealand, it was still very modest and towards the end of the 1870´s the development stagnated. This could be linked to the dominant trade life of the town concentrated its efforts on increasing its trade by sea and therefore invested large sums in trade ships, mostly sailing ships. When the steamships gained ground it turned out to be a bad investment, moreover, the development also resulted in fewer ships berthed at Elsinore, and that caused an important basis of the town’s trade life disappeared. 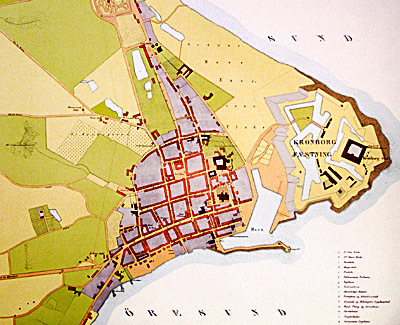 The harbour enlargement in 1862 was not comprehensive enough and plans to make Elsinore an emporium for the Baltic Sea trade did not come off. Around 1889 the town with its 8.978 (1906: 14.534) inhabitants was in fact declining. Not until 1882, when the Elsinore Iron Ship and Machine Yard was built, the development started to turn and from then on a real industrial breakthrough was happening. The laying out with Mads Holm in the front brought with it large investments, increased mechanization and a large need for manpower. Around 700 workers were employed in the enterprise, of these approximately 300 from abroad. The harbour was enlarged once again and in 1883 the first new ship was launched, the propeller steamship S/S Elsinore and with it approximately 1000 employees and many subcontractors the shipyard became the dominant factor in the economical development of the town towards the 1880´s. Another important factor concerning the industrial revolution was the establishment of infrastructure, which connected North Zealand to the metropolitan area. The sea route was there, of course, but in 1864 the north railway was opened with connection to Copenhagen via Hillerød. The transportation of goods from the terminus to the town centre was done via a horse drawn line and from this the name “Trækbanen”. Out of fear of competition from the capital there was local resistance against the establishment of the North railway and the Coast railway, which was opened in 1897. With the opening of the Hornbæk railway in 1906 a substantial improvement of the area’s infrastructure was the result with better connections to the surrounding area, among other things cloth is transported from Hellebæk, tile from Ålsgårde and paper from Havreholm. The transport development was to some extent also a result of the transformation of the area to a recreational area for the metropolitan region. And to some extent, this is still the case. The sea trade´s fear that the new communications would certain parts of the trade transport was well-founded and with the final lifting of protection zones around the market town in 1920, the time where obstacles were put in the way of the free trade, was finally over. Around the turn of the century the most important factors for the industrial development was provided: First of all with the establishment of the shipyard, the necessary capital and investments and labour, which also came to the town, an extension of the infrastructure and the lifting of earlier days´ restrictions on production and trade. With the establishment of Elsinore Technical School in 1885, a modern education of the work force was also begun. With the beginning industrialization and the removal of the guilds the first attempt to establish a trade union was made in Elsinore. 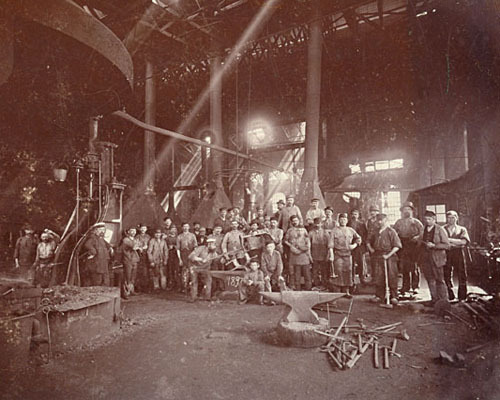 The first attempts took place inside the earlier guild-organized skilled trades in the beginning of the 1870´s, but the economic decline around 1876 stopped further developments. The first lasting unionisation took place among the printers in 1881 and in connection with the establishment of the shipyard there were other efforts. An economic crisis in the middle of the 1880´s brought about another setback, but the establishment of the Social Democratic Society in the summer of 1885, the Union of Smiths and Mechanics in 1887 and the Common Union and Workers´ Society in Elsinore of 1888, became the basis of a more lasting and united organisation. It is evident that the changing market conditions, especially for the shipbuilding business, had a great impact on the development. This was also evident into the 1890´s and not until the middle of the 1890´s the cooperative union carried through agreements for several of the trades in the shipyard. In 1892 the gardener Christian Hansen was elected to the town council as the first Social Democratic council member in the country and in 1894 the Social Democrats had three members elected to the town council through a joint electoral list with the Venstre-party. A final arrangement about the entering of agreements was not reached until 1896, after a comprehensive union conflict in the shipyard. It started with the lockout of the riveters and involved 900 employees. It was a major conflict according to the times, and it took a fortnight of negotiations to reach an agreement about a wage increase and a three-year agreement and the establishment of a fixed negations system, where the cooperative union negotiated on the behalf of the trades. The negotiation results of the shipyard and their wage rates became pacesetting, but in 1899 an extensive and 3 months long conflict broke out in Elsinore, but it did not include the shipyard. The Cooperative Union had effortlessly negotiated an agreement, which involved the reduction of the working hours from 60 to 58 hours and abolished the hated fine system, which was in the shipyard’s working regulations. In 1888 the town only had 7 trade unions with less than 300 members. Around the turn of the century there were 32 unions with approximately 1800 members. Around the turn of the century a worker made around 15-20 kroner a week. In itself that does not say much, but unfortunately there are no surveys from Elsinore concerning the budgets and conditions of life of working families. If you compare to other places in the country, it is plausible that 25% of the income went to house rent and the rest went to food, fuel and clothes in that order. A method to reduce expenses in the daily necessities and deprive the capitalists of their dominant influence on production lies in the cooperative idea. The farmer’s cooperatives from the 1889´s, which were inspired by the English workers´ cooperative wholesale societies, could have been the inspiration, but the cooperative idea has deep roots in the labour movement. In short, the idea was by producing jointly, buying and distributing different goods and services, they were able to do it as cheaply as possible, without the expensive intermediaries and to the good of all. The first example of cooperative wholesale in Elsinore was the establishment of “the Workers´ Coal Supplies” in 1892, but later many initiatives came along for cooperative operations and social security.